The cooling system on a vehicle can be considered an air/coolant type of design, since the proper operation of the cooling system relies on a means in which coolant releases heat from the engine to the outside air. The radiator is where the heated engine coolant is able to release heat through a multitude of microvents. 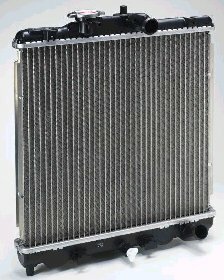 Most vehicles today use a crossflow radiator design. Crossflow is the sideways movement of coolant through the radiator. In the past, radiators were of the downflow variety. The downflow radiator consisted of a top tank and a bottom tank with tubes connecting them. Sandwiched between the tubes were metal fins that dissipated heat from the coolant to the outside air. Heated coolant would flow into the top tank and circulate through the tubes to the bottom tank returning coolant to the water pump. Crossflow radiators are similar in operation but instead of a top and bottom tank they, use tanks on the sides of the radiator. Heated coolant will flow into an inlet on the top of one side of the automotive radiator and through the tubes connecting the tanks and out of the bottom of the opposite tank. They are similar in the fact that they both use individual tubes and cooling fins between the tubes and hot coolant flows into the upper inlet of one tank and the bottom outlet of the other. Crossflow designs provide a greater area for heat dissipation while allowing more low profile hood designs. Vehicles using downflow radiators are currently large trucks that do not require low profile hoods. Years ago most vehicles used downflow radiators making them easier to remove and repair, but as vehicle designers were creating more low profile vehicles, crossflow radiators evolved into use in almost all passenger cars and light trucks today. Radiators can be subject to internal flow restrictions due to improper maintenance. Coolant should be changed regularly to prevent build up of deposits from the breakdown of engine coolant. A radiator that becomes clogged due to deposits can only be cleaned by disassembly and physically cleaning out each individual tube. Normal flushing will not usually clean out accumulated deposits. Radiator cooling fins should be kept clean and clear of debris to allow proper airflow. Care should be taken not to mount vehicle accessories that could block air flow across the radiator. Auto repair jobs involving the cooling system can be as simple as removing debris such as leaves, twigs, and bugs from the face of the radiator to replacing an old and clogged radiator. 3 Comments on "Auto Radiator"
I agree that normal flushing does not clean out accumulated deposits. We were doing that before. Now we’re more meticulous especially in cleaning our radiators.